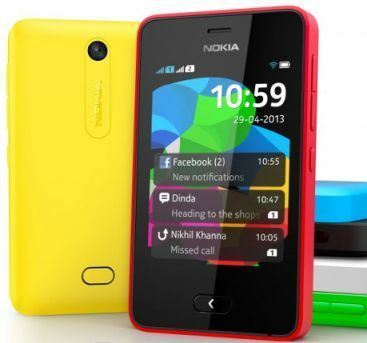 Nokia has officially announced its new budget touch phone Asha 501 in the Asha series. This is the first device which comes with new redesigned Swipe user interface of Asha software platform 1.0. The Asha interface has redesigned with more UX elements from the N9 phone’s Meego user interface. The phone features a 3 inch QVGA touch screen with the resolution of 320x240 pixels and it is powered by 1 GHz processor. Asha 501 has 128 MB of internal memory and comes with 4 GB microSD card pre-installed in the box. Also you can extend the memory up to 32 GB via microSD card. The phone sports a 3.2 MP rear camera and there is no front camera. It has the connectivity options are 2G, Wi-fi, Bluetooth and it equipped with 1200 mAh battery that supports 17 hours of talk time. The phone comes in single and dual sim variants and six color variants. The phone is available in six beautiful colors are Red, Yellow, Green, Blue, White and Black. Nokia Asha 501 is priced at $99 without tax. So the price will be 5000 to 5500 in Indian rupees and the phone will be available from June 2013.